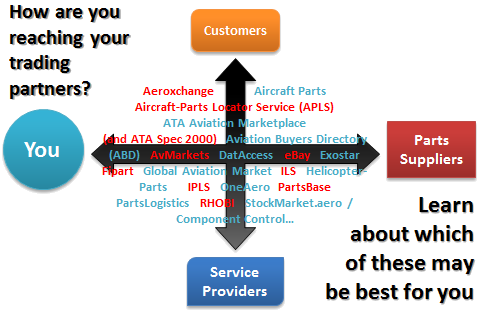 Are you using the proper websites / Marketplaces / mechanisms to reach each of your business partners globally in regards to aircraft parts trading that meet your current business needs? 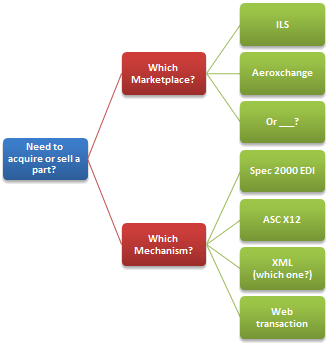 When is the last time you analyzed your online parts-related procurement and/or sales mechanisms? Get smart(er) about where you conduct business online! We also provide key statistics and data on most of the sites, so you can make an informed decision on which may meet your business needs. 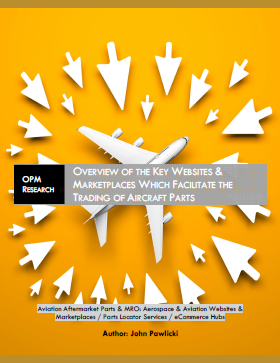 This unique and informative report provides you with a resource which helps you decide WHERE to conduct your aircraft parts sales/purchases, how to go about doing so, and information on how other companies are doing so today. We also provide a detailed reference guide on using aviation/aerospace industry mechanisms, and key pointers on how to conduct business via the Internet safely and securely (and via industry standard Type B and X (XML) networks, including ATA Spec 2000), and much more. The REPORT DETAILS section of this website provide a brief overview of the contents. Find out what you should know about which sites you should be using for your aircraft parts transactions. "This detailed report goes beyond the marketplaces to provide a comprehensive insider’s view of e-commerce tools and practices in the industry." This report is written for anyone involved with handling aircraft parts. The data provided concerns not only personnel which are directly involved with procuring or transacting aircraft parts, but those involved in the technical side supporting IT-based transactions. 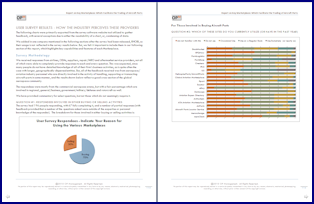 Our report provides needed data that any organization can make use of. We utilized several approaches to gathering data from various data sources (research, surveys, interviews, and analysis). 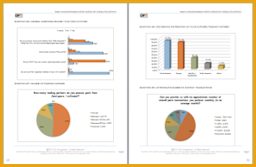 Our extensive network of knowledgeage industry contacts provides OPM Research with a key resource to draw information from, and this provides you with a high-quality report to depend upon. For a limited time, we have reduced the price of this unique report. Take advantage of this offer and acquire a copy of this incredibly useful report today. All copies are delivered via an emailed link to access a downloadable PDF file. Data is not only the lifeblood of any modern enterprise today, but having key data provided in a readable, presentable manner allows you to make more informed business decisions. This report is quite simply the most comprehensive resource available on this set of topics today. 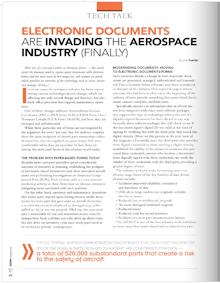 Discussion on how electronic forms (eForms) are slowly replacing paper documents, primarily the FAA 8130-3 form. Wrote a two-part detailed series of articles covering the emerging industry trend of replacing paper-based documents with electronic data. Discussed was not only how this will affect internal processes, but also how the data is secured and how these eForms are 'better than paper'. 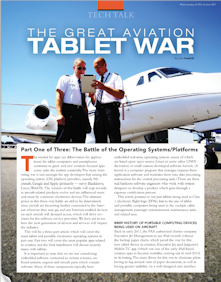 Part 1 of 3 - The Great Aviation Tablet War - The battle of the operating systems and platforms (Apple vs Google vs Microsoft). In-depth three part series which discusses the current landscape on the differing options for tablets which are taking over from laptops in aircraft. 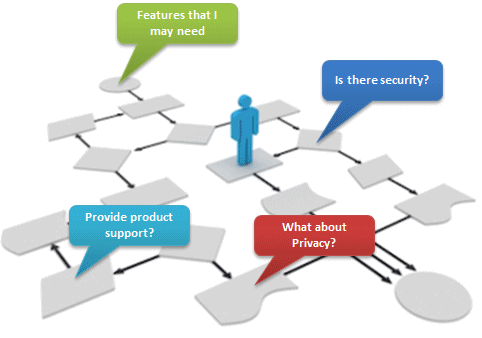 Part 2 is an overview on the various apps, and Part 3 discusses security aspects. We developed a cutting-edge training course on all aspects of the FAA Form 8130-3 form, including the new 'Electronic Recordkeeping' aspects. We cover the eForms and digital signature capabilities in detail, so you can understand how to generate, accept and manage eForms. This course was developed jointly with a retired inspector who was in charge of this area at his time at the FAA. Please contact us for further details on our capabilities and how we can provide such services for your organization. As part of a team at Virtual Security International (VSI) initially, and then via ITD, researched, provided analysis, and wrote/publicly-presented white papers and reports on various emerging cybersecurity-related projects for new aerospace/aviation topics. 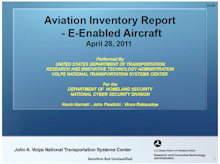 These projects were conducted for Volpe on behalf of their DOT, FAA, DOD, NHTSA and DHS customers, on various aerospace/aviation, automtive and cybersecurity projects. 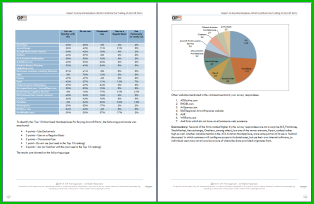 ©2011-2015 OP Management (OPM) / OPM Research and/or its Affiliates. All Rights Reserved.